In this paper we consider the possible consequences that accession to the World Trade Organization (WTO) bears for Belarus. Our approach is based on partial equilibrium. We have applied a method of locating specific 'sensitive' points in the economy and treating them as separate items: specific elements in the economic system on which WTO access will have an appreciable impact. Our research focuses on Belarusian manufacturing. We first determine possible changes in access to foreign markets associated with the cancellation of discriminatory non-tariff, antidumping and other restrictive measures introduced by WTO members. Total losses to the Belarusian manufacturers are currently estimated to be of the order of USD 230-250 million a year. Lifting those barriers will constitute the immediate short-term benefits to Belarus on accession to the WTO. In order to assess the short-term impact of WTO accession on Belarusian manufacturing, the scenario used assumed a reduction of tariffs, complete removal of discriminatory measures and a lowering of market barriers to Belarusian exports. A quantitative assessment was made of the gains and losses by manufacturing branch, followed by a simple sensitivity analysis. The latter revealed the Belarusian manufacturers' ability to withstand increased import competition up until such time as the requisite restructuring measures have been introduced. Summary conclusions are drawn for each branch in the light of those findings. 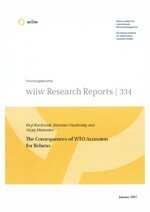 One section of the paper focuses on the implications for Belarus of the Russian Federation's accession to the WTO. Consideration is given to the possible impact on Belarusian exports to the Russian market. The analysis shows, however, that Russia's joining the WTO does not incur the risk of Belarus losing its share of the Russian market. In the final section, consideration is given to state support for agriculture and the development of service markets, with a discussion on possible forms of, and limits to, liberalization. The final conclusion is that liberalizing the imports of certain items is very much in line with the need to revise the current structure of trade specialization in Belarus. Import liberalization should not be seen simply as a trade-off for the non-discrimination of Belarusian exports. If the economy of Belarus is to benefit, the country must pursue a consistent policy of cutting back or closing down those manufacturing activities that are unlikely to evolve into internationally competitive industries. Liberalization of the domestic market in the wake of WTO accession must be in keeping with: (a) the financial viability of specific industries; and (b) the need to provide in a manner compatible with WTO rules and regulations additional protection to those industries with high value-added that are of strategic importance to the country’s future development.